Perspicuous and Adjustable Links Annotator (PALinkA) is an annotation tool that I developed more than 10 years ago and which proved surprisingly popular, especially with linguists. The idea of the tool was to be as simple as possible for the annotator. I did most of the work in my spare time, so as new tasks and interests came, the tool was abandoned. I still receive emails from people willing to use it. This page is an attempt to make it again available, and who knows, maybe even revive it. Over time I have developed various versions in order to address the needs of projects that used PALinkA. Here you can download some of them (more to be added in the future). Disclaimer: These versions should be ok, but use them at your own risk. This software is supplied “AS IS” without any warranties and support. Download the version used to annotate events in the NP4E project can be downloaded from here. This version should work out of the box on a Windows machine with Java installed. Unzip the file wherever you want and double click on the runme.bat. It should not be difficult to make the program run on a Linux or Mac computer. The data directory contains a few files you can play with. The preferences file used is customised for the NP4E project and annotation follows the guidelines developed in the project. 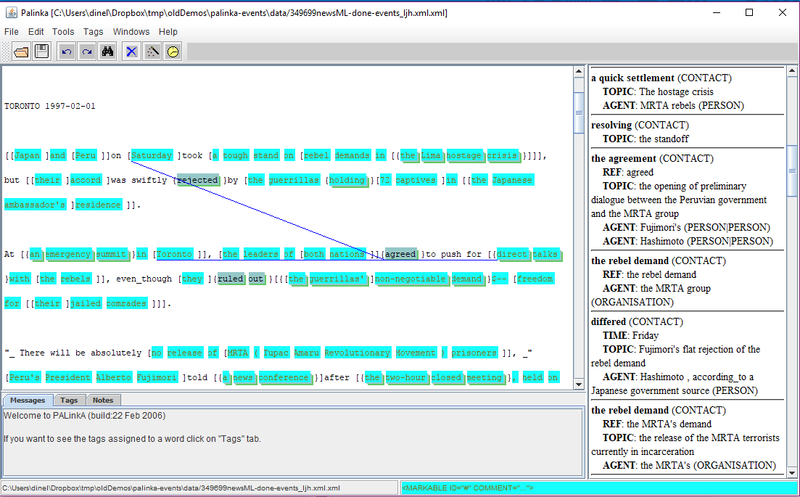 One way to use this version is to download the corpus annotated with NP coreference annotation and annotate the events. In this way the corpus is already in the expected format. If you think PALinkA can be useful for you and you would like to use it please use the contact page to get in touch. If you are a Java programmer who would like to help reviving this project also get in touch.